Over a month after Tibetan protesters launched demonstrations demanding independence, news reports and opinion pieces continue to appear daily. Many discuss issues of sovereignty, development and relations among nationalities. Others focus on responses, including protests and counter-protests over the Olympic torch relay, or calls to boycott the Beijing Olympics. For many Americans with varying political views, Tibet is inextricably linked with Buddhism. The Dalai Lama, living in exile in India, is seen as a leader for spiritual enlightenment and world peace. Most in our country, however, know little about Tibet’s political and economic history. In “Friendly Feudalism: The Tibet Myth” (January 2007), political analyst and author Michael Parenti pointed out that before the 1949 Chinese revolution, Tibet was an abysmally backward feudal society. Most arable land was still owned by rich secular landlords or wealthy lamas (Buddist spiritual teachers), while most rural Tibetans were serfs, bound to the land, every aspect of their lives controlled by overlords who often tortured, mutilated and sexually abused them. While Parenti and other observers are critical of many aspects of development since then, it is generally agreed that the life of ordinary Tibetans has improved greatly, both economically and socially. Narasimhan added that India cannot support claims to an independent Tibet since it recognizes by treaty that Tibet is an integral part of China. Others have noted that the Dalai Lama himself calls for greater autonomy, not total independence. Some 95 percent of the population of the Tibet Autonomous Region (TAR) is Tibetan, and over 90 percent speak Tibetan as their first language. Many ethnic Tibetans also live in other parts of China, including Qinghai and Gansu provinces. Writing in The Hindu in 2004, correspondent Amit Baruah said the income of the average Tibetan farmer living in the TAR has risen as much as sevenfold since the 1960s. Ninety percent of children are in elementary school, and life expectancy has risen to 67 years from 35 during that period. Writing last week in Foreign Policy in Focus, Ross Gearllach , an analyst at the Institiue for Conflict Analysis and Resolution at George Mason University, pointed out that the recent protests have not focused on government or army facilities, but instead have targeted businesses owned by Han Chinese. Much has been said about the history of Tibet’s relation to China. In “Tibet: An Inalienable Part of China,” first published in the German Communist monthly Red Fox and reprinted in the Australian newspaper, The Guardian, Rolf Berthold noted that the Chinese Republic’s first provisional president, Dr. Sun Yat Sen, proclaimed in his inaugural address that the Han, Manchu, Mongols, Hui and Tibetans were unified in one state. 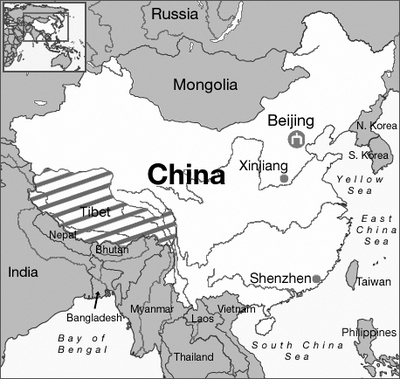 The republic’s constitution said Tibet was part of China. Tibetan local government representatives participated in forming the Kuomintang government, and it in turn confirmed the Dalai Lama and had representatives in Tibet. Given the widespread U.S. efforts to undermine and subvert the socialist countries following World War II, it should be no surprise that Washington has had a hand in developments regarding Tibet. It is generally acknowledged that in the period leading to the 1959 uprising, and continuing at least until 1973 when U.S.-China diplomatic relations were re-established, the CIA funded opposition movements there. The National Endowment for Democracy reportedly picked up this function during the Reagan administration. In a sign the Bush administration is reaching for a more direct relationship, The Hindu last week cited Secretary of State Condoleeza Rice’s statement that Washington wants to open a consulate in Tibet.